As I mentioned earlier in the week, my focus word (or is it a guidance word?) for 2018, is Flourish. I want to flourish this year, and I want to help others flourish, and I want to do things with a flourish. So, what better way to start my Poetry Friday posts, than with a poem and a post about flourishing. Interestingly, my first every Poetry Friday Post, three years ago was a New Year post. Since I wrote that , I have been a regular part of Poetry Friday but not always consistent. Like many members, I have come and gone. Life has got in the way sometimes – so some of those periods of absence, I was busy flourishing, busy with career stuff. Other times, life was hard, and finding time for blogging took a back seat. But every time I got back to Friday posts, there were people there welcoming me back – commenting on my posts, or sharing wonderful things on their own blogs. And each time I’ve realised that I’m part of something big, a flourishing community of poets from around the world. One special thing that the Poetry Friday community does is to organise poetry swaps. In these, participants are given a name (or two) and asked to send a poem to that person, via snail mail. My comings and goings have meant that I’ve never participated – I always seem to have missed the call outs. Until the most recent two. At last, at the end of last year, I took part in the Winter Poem Swap. Of course, it isn’t winter in my part of the world, but that didn’t worry me. I duly sent a Christmas themed package off to my recipient, Keri, with a poem about the very fact that she was in cold and snow and I wasn’t, and some other goodies. And then – hooray! – I received a package of my own, from the wonderful Irene Latham. Isn’t that awesome? The significance of the pouch is also special. Irene had read my posts about ‘old’ poems and poem-hoarding (which so many in the poetry Friday community related to), so she sent me a pocket in which to hoard my poems. I plan to fill it with tiny poems, starting with the poem-stone. I also plan to fill the notebook with poems, of course! Thanks so much Irene. 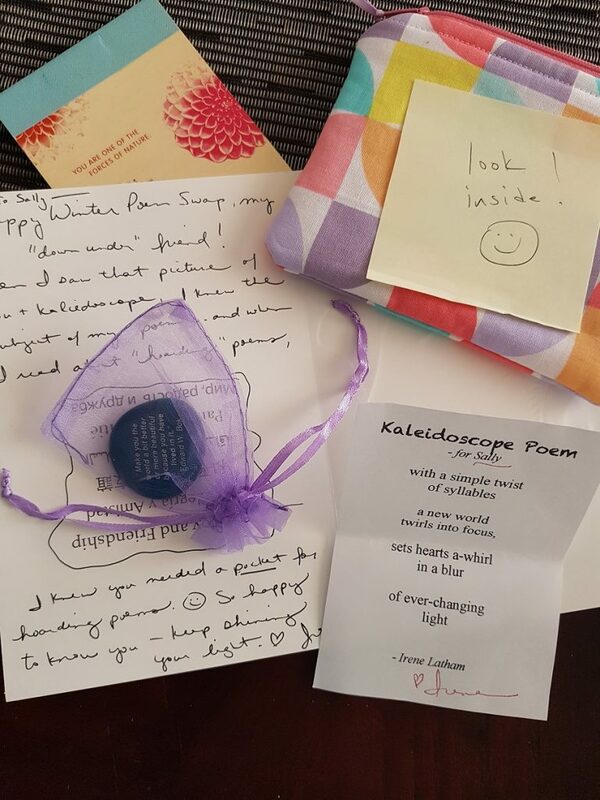 This is why I am part of the Poetry Friday community – not for the gifts, but for the friendships which flourish! I have the gift on my desk and every time I see it, I am reminded of the magic way that poetry brings us together. The second exchange which I’m participating in is the New Year Postcard exchange. This time, it’s a poetry postcard. I wrote my ten cards on New Year’s Day, and they’ve been sent off across the seas (or the skies, really, since that’s how they’ll travel), connecting me with ten other Poetry Friday members again through poetry. And, as cards start to arrive in my mail box (I’m watching it eagerly! ), I’ll be reminded again that friendships flourish through poetry. So, I look forward to being a more regular contributor to Poetry Friday this year (I’ll even be hosting the round up for the first time in February). It’s become an important part of my identity as a children’s poet – and, though I’ve only ever met two of the other members in person (yes, there are two other Aussies!) – it’s the friendships that make it so special. I hope you’ll flourish with me in 2018. Happy New Year! For more Poetry goodness, check out the other Poetry Friday posts. This week’s round-up is at Reading to the Core, where, coincidentally, Irene’s new book is also featured. Cheers to a flourishing year surrounded by a flourishing community! Irene’s gift for you is lovely and thoughtful. I hope your year brings many opportunities to flourish–and grow and glow and thrive and strive and all the things in your poem. Thanks Kay. And here’s to a great year for you, too! Have a great and glowing 2018, Sally! 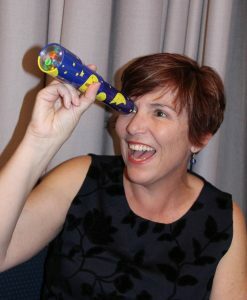 I can feel the “flourishing” energy kaleidoscoping off of your blog post Sally! What a fun word and filled with so much opportunity, enjoy it this year. Loved the energy in your poem and thanks for sharing all of Irene’s treasures that she sent you. A kaleidoscope poem! Marvelous! I look forward to seeing all of your flourishes and flourishing this year, Sally (hey, did you know that Donna at Mainely Write also chose “flourish” as her OLW?). No i didn’t know that Tabatha. Donna and I are word twins! I love the word pairs in your resolution poem! They start big and end small, but even the smallest word (be) is HUGE! Thanks Mary. Yes, i didn’t set out to get smaller, but once I had several word pairs, the ‘see bee’ one seemed to best belong last, and the rest followed suit. Oh do participate Molly. I felt a bit intimidated too – everyone seems to come up with such clever ideas. But it was such fun! Poetry Friday is one I don’t like to miss, though, like you, sometimes I must, and then it feels as if there’s a hole in my week! Irene’s poem is perfect, using your kaleidoscope picture and serendipitously adding in “sets hearts a-whirl”, connected to “flourish” don’t you think. I’m glad you’re doing the swaps now, too, Sally. Thanks Linda. And yes, the hearts a-whirl line is like a portent to my chosen word. I like your word flourish, it can mean so many things from swordplay to signing with a triumphant swirl to thriving in one’s skin. I hope you do all of those things. 🙂 I love Irene’s kaleidoscope poem also. What a treasure she is. I think flourish is a great word. And I love your Things to Do poem. all great things to accomplish. Thanks Rebecca. Happy New Year. Flourish is such a great word. Amd Irene was spot on with her poem and package. Here’s to a great 2018. Thanks Jone. I feel sure that 2018 is going to be a great year! What a great focus word for 2018! I know you’ll do just that too- FLOURISH! What a perfect poem and a perfect pocket! Such a great idea. I am hit or miss on Fridays and so wish I could be a more regular contributor. The weekends I do participate, I am always left inspired! Happy New Year, Sally! Flourish is a terrific word, and I love your poem celebrating it. Irene is one of the kindest, most generous people on the planet. Her Kaleidoscope poem is perfect. Here’s to a year filled with new worlds twirling into focus! We poets derive much sustenance from this sense of community Sally. This year I aim to urge book shops to feature more children’s poetry. Even having a T shirt made for my campaign. I like your word flourish. It is such a healthy, positive word. I also love Irene’s book which I aim to purchase when it is available. I like the various initiatives you have mentioned that promote that sense of community. All great stuff. May you continue to flourish in 2018. Good luck with all your projects. Greetings from frigid Boston! I’m working on my poem postcard exchange cards today on our second snow day off from school. What a lovely collection of treasures from Irene. A great way to kick off your new poetic year. And I especially love that she wrote a kaleidoscope poem just for you. Treasures indeed! Thanks Christie. I hope that cold breaks a bit soon. What a lovely post. I share your feelings about the Poetry Friday community. It’s really fun and inspirational to be connected to people that care deeply about words and poems and writing–especially writing for kids. I didn’t start participating in the exchanges until recently. It’s super fun and encouraging to me as a writer. I look forward to seeing the postcards delivered and received. Enjoy some sun today. I am not at work because it is literally so cold that it’s not safe to get all the kids to school. Ack! I love the thought of summer right now. Thanks Linda. I’ve seen all the media reports about the cold in the US- and just can’t imagine it. I’ve never even seen snow,let alone the kind of conditions you have right now. Stay warm.